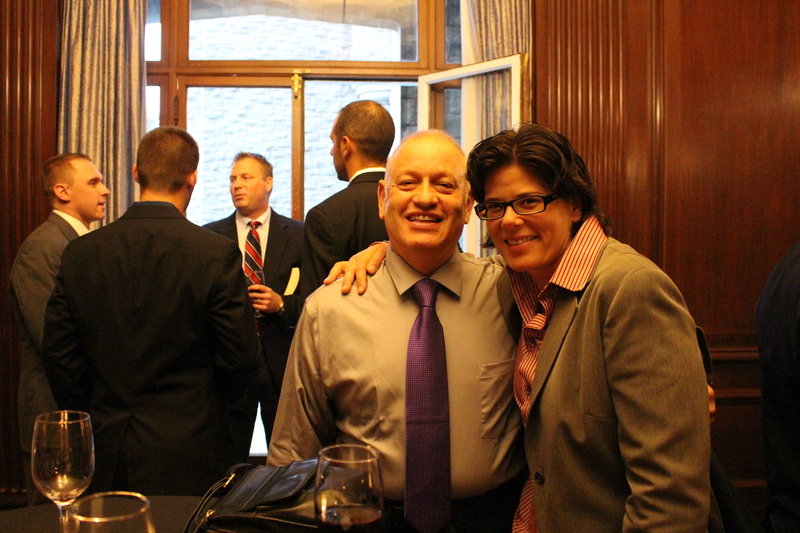 Over the past 15 months, the Manhattanville College Department of Athletics has worked tirelessly to prepare for its first Athletics Hall of Fame induction ceremony, which was held last Saturday night in the Reid Castle. 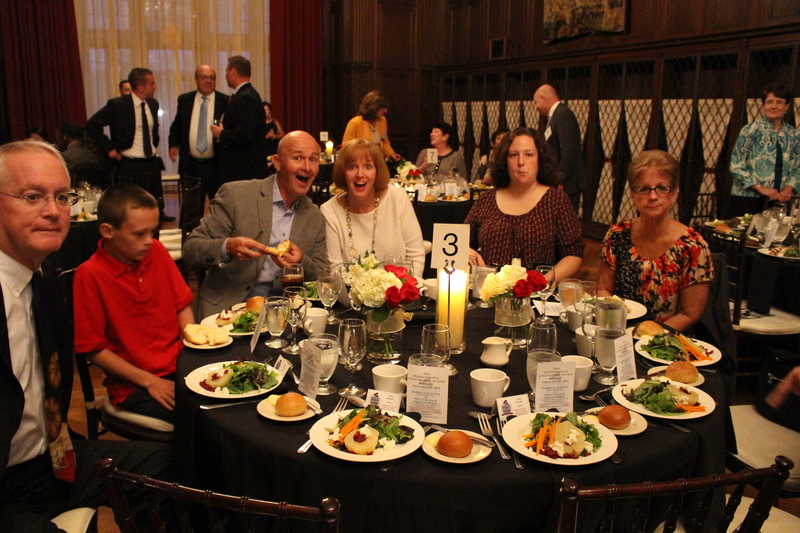 The campus welcomed more than 150 alumni, faculty and guests for a wonderful evening celebrating the Class of 2014: Theresa Carey ’82, Joel Daunic, Roger Dunphy ’80 and Judith Felice Shea MD ’81. The event started with a cocktail reception in the Ophir Room where alumni reconnected with one another over drinks and hearty hors’ d’oeuvres. The cozy atmosphere was full of spirited chattering and laughter as former Valiants recollected college memories. Not only did alumni enjoy reuniting with their classmates, faculty members, Professor Lawson Bowling and Professor John Murray, were also among the guests of the evening. 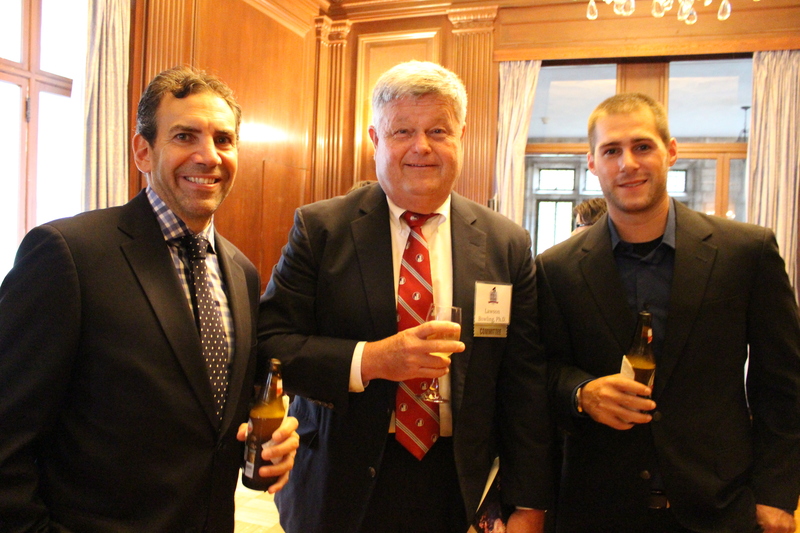 Professor Lawson Bowling (center) with alumni at the event. The reception was followed by dinner in the West Room. Inside the spacious dining room was a projected screen showing touching images of the inductees during their time at Manhattanville. Keith Levinthal, Director of Athletics, opened the ceremony by thanking attendees for joining in this historical event. He also shared the struggle as well as the joy his department faced preparing for the evening. The night was indeed full of wonderful anecdotes and memories. Each inductee was introduced by someone of their choosing and the speeches were inspiring and humorous. Frank Forker, former Manhattanville Head Baseball/Women’s Basketball Coach, comically compared inductee Joel Daunic to Steve Jobs sharing that Daunic was a man of numerous ideas that changed and shaped Manhattanville Department of Athletics. Following the inductors’ speeches, each inductee was given a Hall of Fame jacket symbolizing the honor. 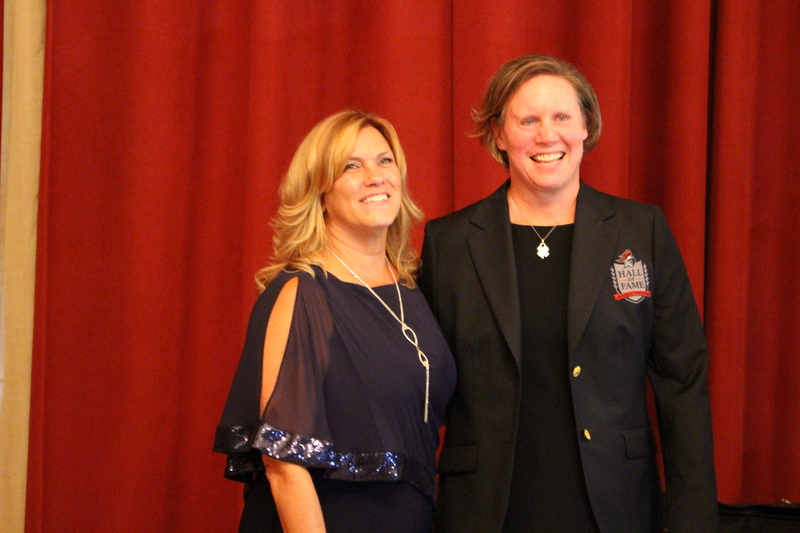 Inductee Theresa Carey ‘82 credited her athletic training at Manhattanville with providing her with a work ethic in life. The Inaugural Athletics Hall of Fame induction ceremony was not only a successful evening but also an amazing trip down memory lane for Manhattanville alumni and faculty. It is also worth noting that the nominating process for Manhattanville Athletics Hall of Fame Class of 2015 has now begun! Please visit http://www.govaliants.com/halloffame for more information on candidate eligibility. Click below for more pictures from the event!